When I was in NC last month I was looking for a magazine to read on the airplane coming home. I had seen this magazine on several blogs but it didn't interest me until I saw this issue about Louisiana. There is a section about Anna Williams. 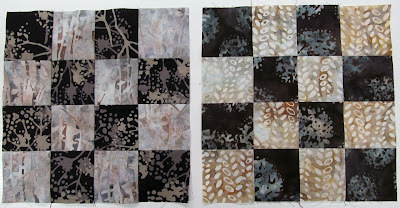 I first saw her quilt tops at the Quilt Surface Design Symposium in Columbus, Ohio around 1992. Her friend Katherine Watts brought the tops and they hung them on the walls of the cafeteria. 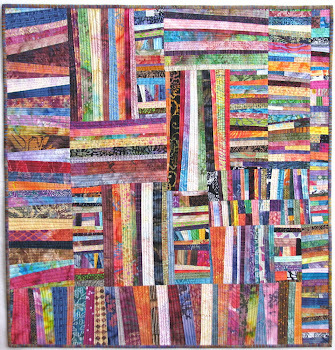 If you don't know who Anna Williams - quilter is you might want to do a search and see some of her scrap quilts. 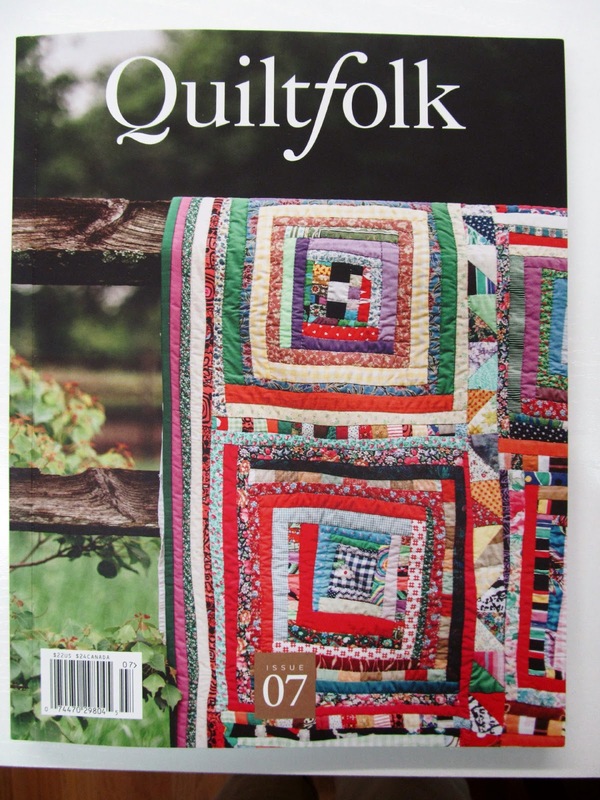 There was a book published by AQS in 1995 about her life and quilts and I didn't buy it for some reason. It is out of print now and is $100 - $300 on Amazon. 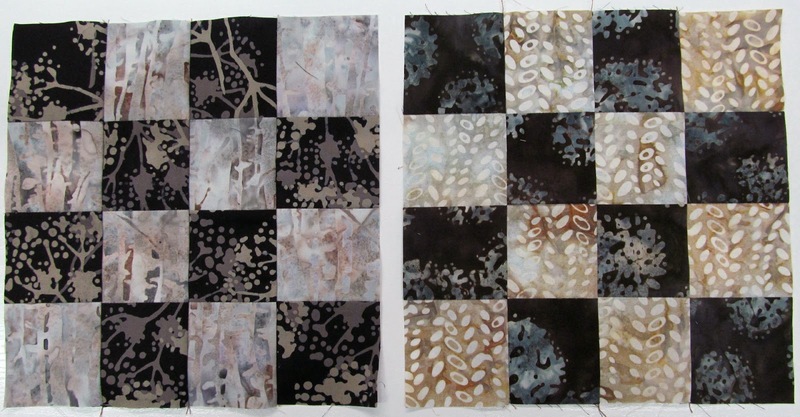 Here are some more of my favorite batik combinations in the neutral 16 patches I am making. 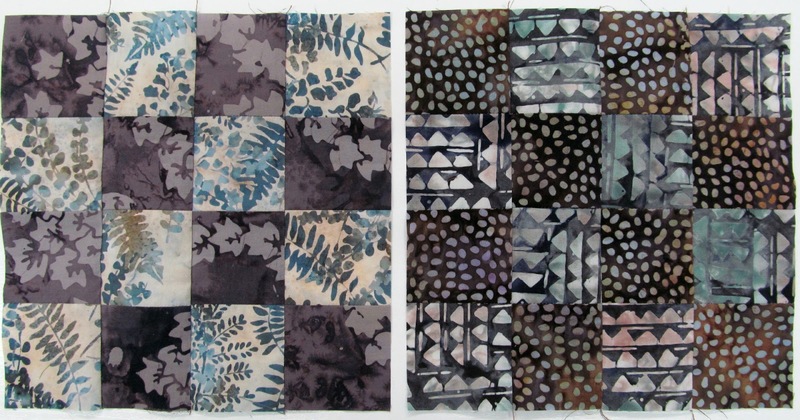 The dark print in the block on the left and the geometric print in the block on the right are batiks from the 1990s. 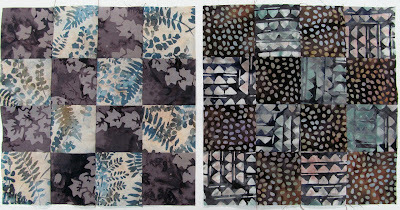 There were so few batiks available in the beginning that I bought almost every one that I saw. There are some that I would never consider buying now but they were so unusual in the early 1990s and I had to have them. Just 3 days left to enroll in my new Online Course COLORWASH 360 with a Bonus: 40 day Virtual Workshop with me. We have students from across the world enrolled and excited to get started on Oct 1. Click HERE to learn more. If you bought a Colorwash kit from me in the past and haven't used it, you're half way there, now you just need the step-by-step assistance from me to get it made. Sign up! If you don't have a kit, no worries we still have kits available for purchase...take a look. And Kaffe fans I have a secret surprise bonus you'll want to know about...my Kaffe directory is also included...read more. Enrollment ends on September 14th! Very excited to start on Colorwash 360. Counting the days. I found her AQS book as an e-book (pdf) -- will go see where I found it and let you know. I have read about Anna Williams over the years. 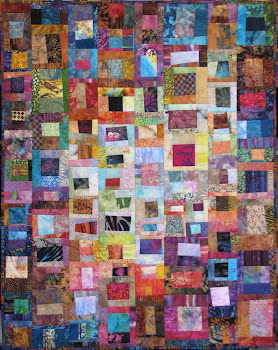 It was amazing how she put together her quilts. I saw what the price of a single issue was for this magazine. Do you think the one you bought was worth the price? I discovered Anna Williams when I was an art teacher. Never been able to find that book. I keep looking at the magazine online and have a hard time making the $75 dollar decision and the back issues $$ also. Do you think the magazine is worth the price? 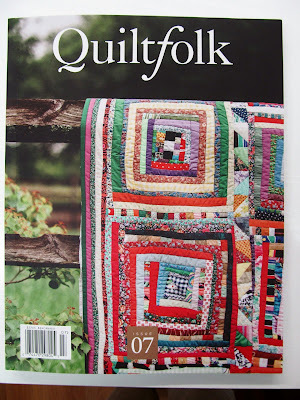 I'm not a quilter, just an admirer of the design work and stitching that goes into them. I've never heard of Anna Williams, just Wanda Hanson, and she's is my idle. But plan to Google Anna and maybe see some of her talent if shown. P.S. I found her and 23 of her quilts were shown ! WOW what an artist she is .